In 1931-2, Margery undertook her most amazing adventure to date, an Air Popularization Tour of Europe, the Middle East and Africa. Margery Durant was clearly the adventurous sort. 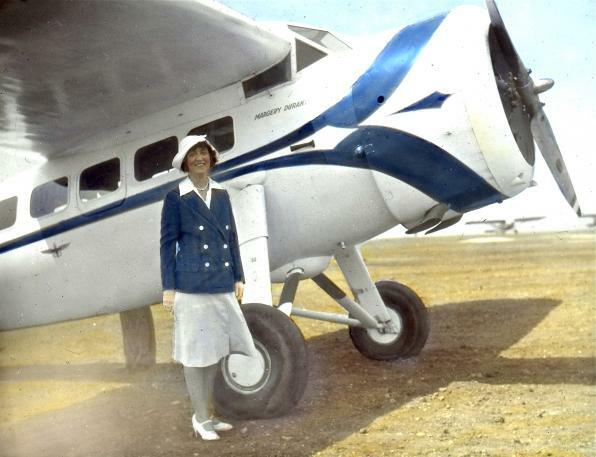 Sometime in 1930, she got the idea of popularizing private air travel by taking her planes across the Atlantic by ocean liner and then flying around Europe, the Middle East and Africa. Lindbergh had flown the Atlantic only three years earlier, and pilots everywhere were out to set new speed and distance records. Newspapers were replete with the often disastrous results. Flying was dangerous, even more so than the horseless carriages that her father began building thirty years earlier. Margery was 44 years old when she started on her trek by plane around Africa. The question is why, and the short answer is that we don’t know. Billy Durant had gone broke in the Crash of 1929, though he wouldn’t declare bankruptcy until a few years later. Margery still had her General Motors stock, and GM was still paying its usual dividend in 1930 and 1931, so money was no object. But in 1932, GM cut its dividend from $3 per share to $1 per share. Margery might have seen the handwriting on the wall in 1930, when GM’s net income began to decline with the Depression, and figured that, plane, pilots and all, it was cheaper to live in Europe and Africa than in the USA. Margery’s personal life was in its usual chaos. So I suspect that Margery had a need to get away from it all, her beloved father included. As for her children, Bill was out in the world, and Edwina was finishing up at Vassar, and her other daughter, Margery, was being raised by her ex-husband, Robert Daniel, in Virginia. Margery felt no compunction about setting off for two years on her adventure (though with one break at home). Why flying? Margery would not marry her 4th and final husband, Fitzhugh Green, until 1933, but had worked with him on My Father. Margery was perhaps inspired by Lindbergh’s and Earhart’s aviation feats to buy her own planes and set off for parts unknown. She became was what known as a “Demonstrator”, one who demonstrated that air travel was safe and convenient, the most desirable means of modern travel. Margery wasn’t a pilot. She hired Charles LaJotte to ferry her on this jaunt. He is best known today for teaching Howard Hughes how to fly in 1927 and for an aerial kidnapping a girl that he wanted to marry. We don’t know how she came to meet LaJotte, perhaps in Los Angeles, where he had a flying school and where Margery’s mother was living, or maybe through Amelia Earhart. We also don’t know if they had a fling on this trip, though there are some chummy photos of the two of them. Margery also brought along a mechanic, Everett Smith for the first leg and James Saunders for the second. They would be needed. Margery’s plane, a Lockheed Vega, called the “Ariel”, powered by two Wasp engines, was loaded on board the SS Hamburg on April 23, 1931 in New York Harbor, after she gave a well-attended press conference at Newark Airport announcing her plans. It was the first time an intact airplane had been transported across the Atlantic on an ocean liner. A second plane, a Sikorsky NC IIV amphibian (with two 420 hp Pratt & Whitney Wasp engines) came later. The trip was equal parts luxury and roughing it. On the European part, it was the finest hotels, and in the parts of the Middle East and Africa where there were hotels, she stayed in them. But they were also out on safari and in villages where accommodations were Spartan to say the least. Margery called it an Air Popularization Tour, her goal being to prove that air transportation was feasible, inexpensive and safe. They had only one mishap on their two-year excursion, losing a propeller in a landing in Kenya, where they had to wait weeks for a replacement. They took the opportunity to go on safari in Uganda where LaJotte bagged an elephant. Other adventures included taking the Emir of Jordan up for his first airplane ride. Along the way, Margery Durant took photographs using glass negatives. She also had a smaller camera, which used black and white negative film. The glass negatives were later colorized by Edward van Altena, one of the most renowned photo colorizers in America. The photographs of the African and Middle Eastern natives taken in the winter of 1932 give a glimpse into another world. 188 of the lantern slides survive. They were saved by Margery’s handyman when her property was auctioned off (along with the Kandinsky’s!) in ca. 1953 in a lawn sale at her house in New Canaan. The tour was major news in America and in Margery’s ports of call. Margery Durant was an aviation pioneer in her own right, as intrepid as Amelia Earhart, but living to tell the tale. Hers was the first air-cooled engined plane to fly around the Mediterranean. The trip covered 17,000 miles. Aviation historians believe that she was the first American, and certainly the first American woman, to fly in Africa.